His Holiness Pope Francis, the Head of the Catholic Church and Sovereign of the Vatican City, met with senior government leaders on the first full day of his papal visit to the UAE before attending the Global Conference of Human Fraternity Meeting. It is being seen as a milestone for interfaith relations in the UAE and the rest of the Middle East. 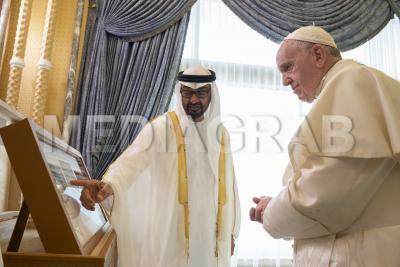 Pope Francis has made boosting ties between Christianity and Islam a cornerstone of his papacy and the UAE government has declared 2019 as the year of tolerance. 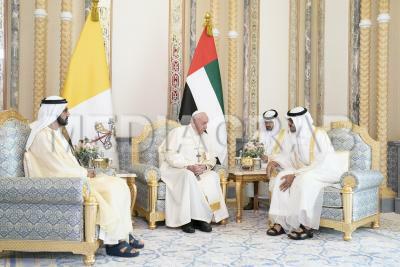 His Holiness began the day meeting His Highness Sheikh Mohamed bin Zayed Al Nahyan, Crown Prince of Abu Dhabi and His Highness Sheikh Mohammed bin Rashid Al Maktoum, Vice President of the United Arab Emirates after a welcome ceremony at The Presidential Palace. The papal visit resulted from an official invitation from His Highness who visited the Vatican in 2016. This will be followed by a visit to Sheikh Zayed Mosque where he will meet with the Muslim Council of Elders. Pope Francis will then attend the Global Conference of Human Fraternity where he will speak alongside His Eminence the Grand Imam of al-Azhar, Dr. Ahmed At-Tayyeb, considered one of the world’s foremost Muslim leaders. Pope Francis’ visit will conclude on Tuesday 5th when His Holiness will conduct a huge open air mass at Zayed Sports City, an event that is expected to attract up to 135,000 people, with the Mass being live-streamed across the globe.